Hemitite is blue and the yellow of the suns light make green until the color of the dust is not of blue hue and then we get a different colored sky. Nice idea, but if l read what you are saying, (Hemitite is a rock) correctly that would mean that Hubble and ESA would only see a green atmosphere. 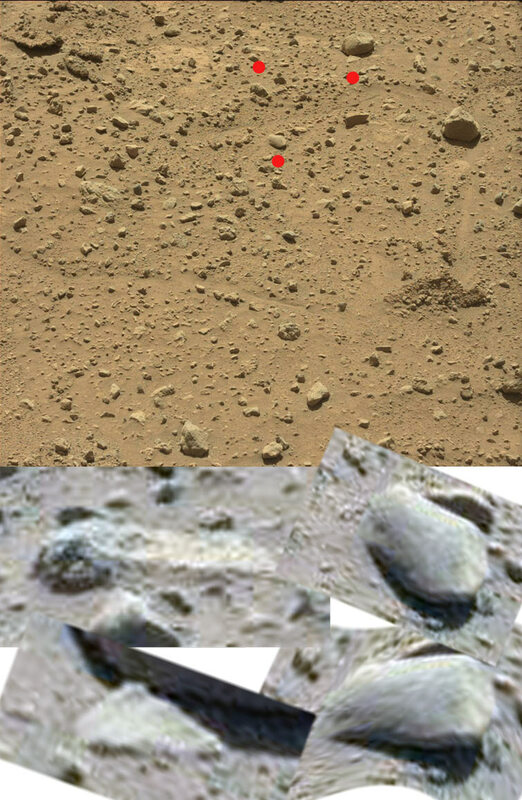 Ok, l have looked into this further, and first image shows a typical Viking 1977 image. Blue sky and so forth. And when Viking two a year or so later landed it took this one, which has a green/yellow atmosphere or sky, so this is what the sky looks like when there is a lot of dust about. Hubble previous images also shows a greenish atmosphere from orbit, (and this was taken midday, rock shadows, so we can't pass this off as a sunset anomaly). And this is a typical VIking 77 image from orbit, or no atmosphere or blue, eventhough early Viking images show a blue sky. And bottom another Viking image showing green, (unlikely you will find this on a NASA/Viking site) although this is vegetation. Blue/red/yellow produces green, but a red/orange sky with more red when the dust picks up produces a red sky, or no getting around this fact, without blue somewhere we wouldn't see green anywhere, (blue has to be present). We already know NASA is lying about the air pressure, (rain drops on the rover) and temp, ranges, (can't have vegetation with minus 200 below a few times a week) and sunsets, (overwhelming evidence showing an Earth like sunset) so it is a given they will BS their way through the blue sky one, (not worth mentioning the gaping irregularities with Hubble and the rest). Pink hue would be the rust from iron oxide content in the air. The difference are from reflected and refractive colors. Brightness of the second image is considerably higher for sure. Blue sky is reflective of water content same as earth. 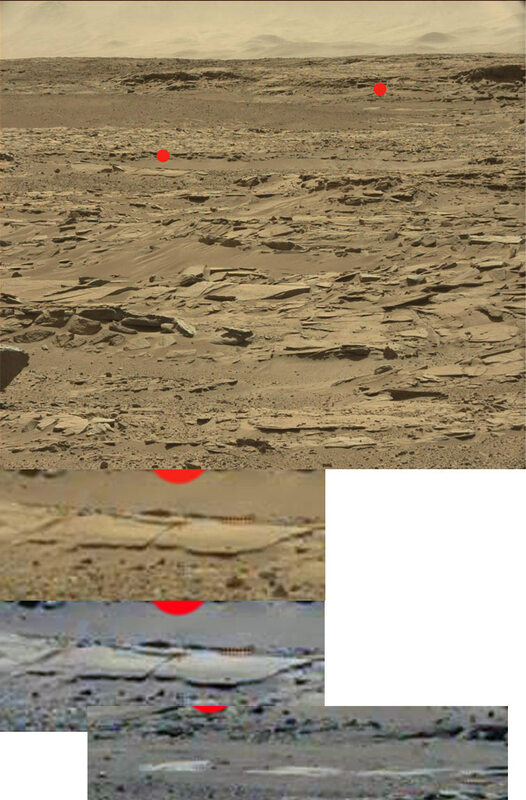 I agree that the global mars image is over colorized with the small image possibly shifted the other direction. The eye can not lie if observed through a telescope unfiltered. Yep, and when Mars is at closest approach, any kid with a $100 dollar telescope can prove for himself that the blue atmosphere is Always present and that Viking images showing absolutely no blue whatsoever are false representations of reality. So people refuse to accept that Mars can support life, or that NASA isn't being 100% honest, because that could lead to intelligent life and grays in particular thanks to NASA's so called leaked evil beliverant grays being interviewed properganda on YT. No evidence no matter how good is enough, since they merely find sillier reasons that they are right, (a bit like convincing that two people who think that they are Mussolini in a mental institution that one of them clearly isn't) impossible since deep rooted fear is present. I havn't come across an evil, race on mars ready to invade Earth far from it. But yet again impossible to convince someone who is coming from fear. Evidence is truth not fear. 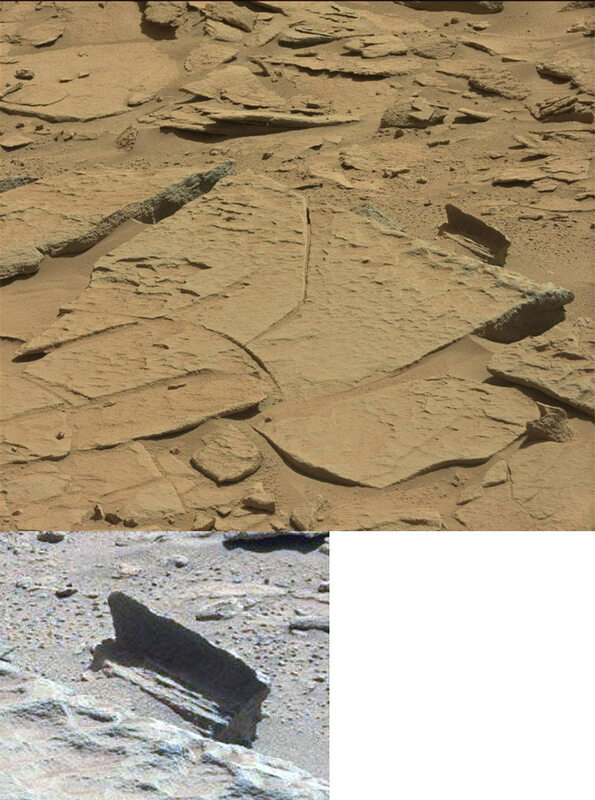 yeah, not an artificial event, but the rock is more interesting, or could be some silver material torn off of something bigger in the past. 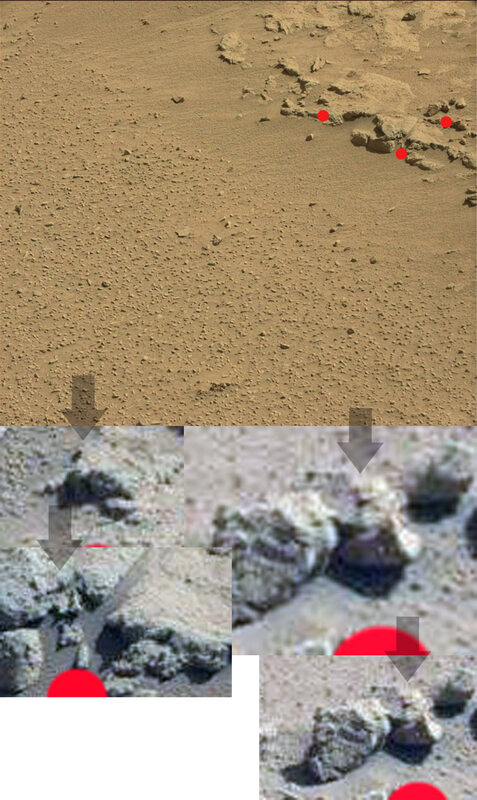 Also a new discusion of the spider crab evolution and possible reality that its still alive on mars. Now just waiting on void to finish a post but most likely I will add one tomorrow after work. 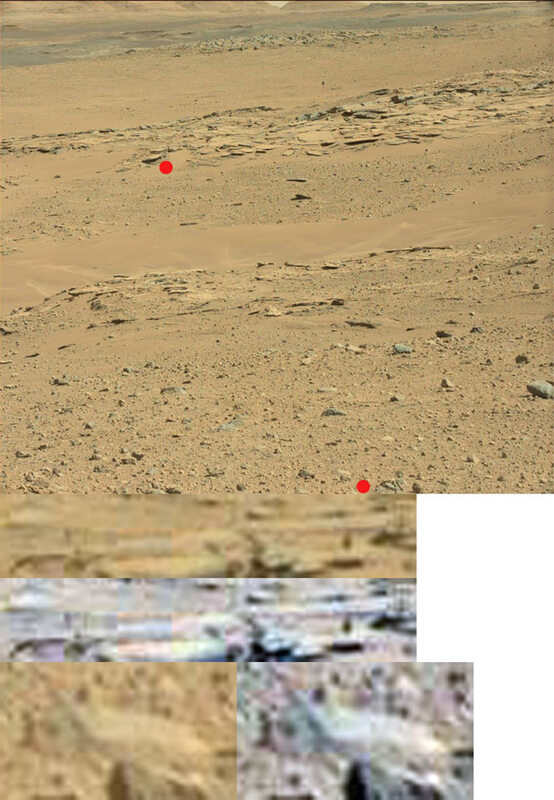 Ok, yes l saw a few things that look like crabs in my video and one black/white spider that the rover drove over, so possible. 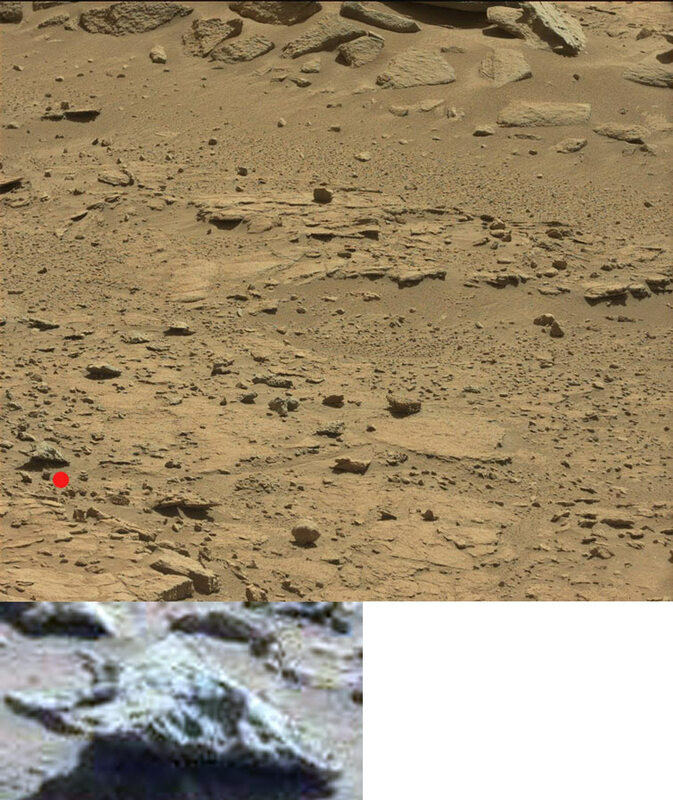 I thought that the lower one was some white creature, but it turned out to be a silver rock ref, the landscape back to us. 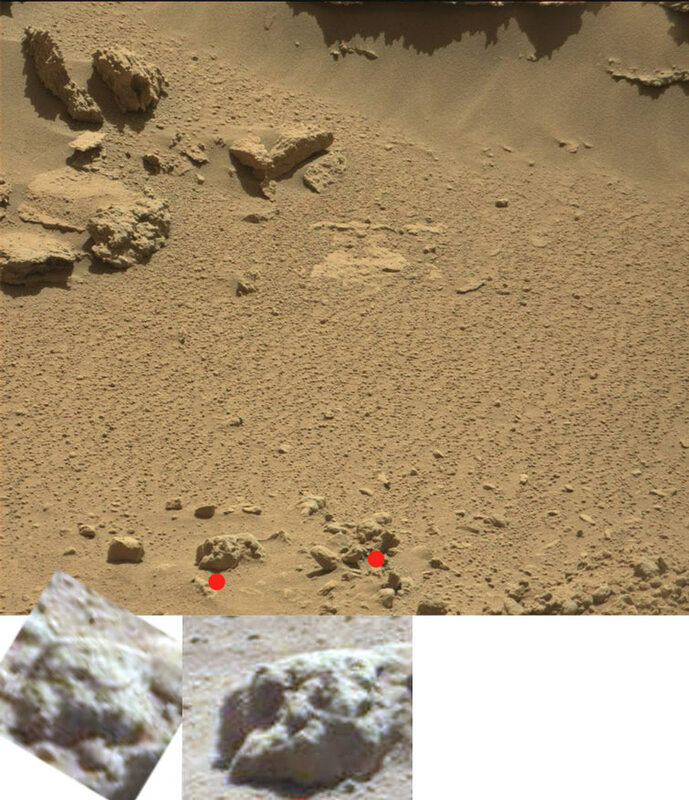 I have also seen the landscape being reflected back to us in fine sand, so silica or a substantial amount of silver looking material is prevalent on Mars. 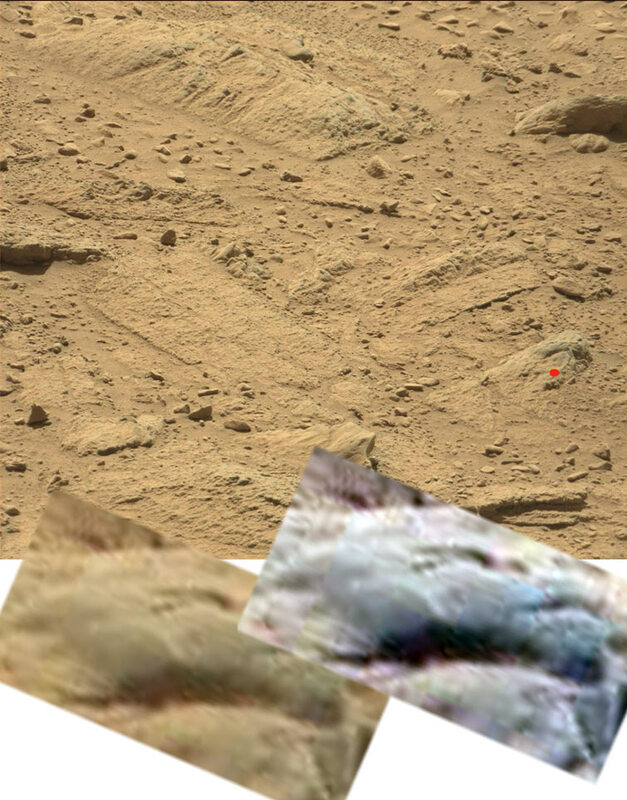 Top image, l thought that the thing on the left was something but it is the rovers robotic arm, and the rover, (middle arrow) is clearly visible sitting on some raised ground with its mast cam cameras, reflecting the orange light of the sunset, (its camera lenses are bright orange). The irony of NASA's agenda is limitless. 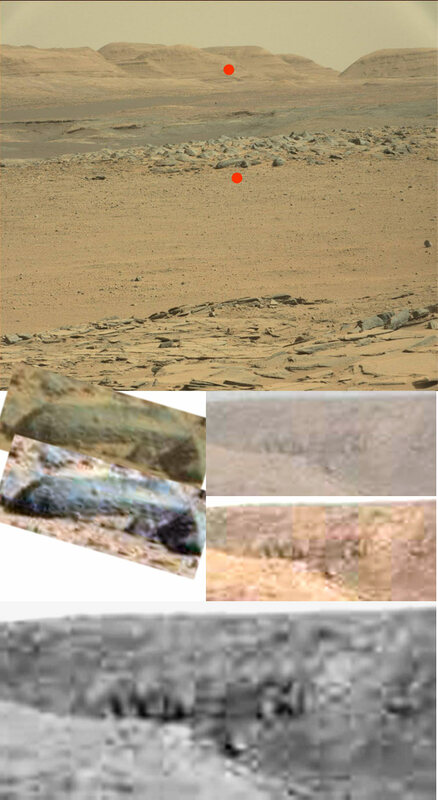 I went through all Oppor, Spirit images of its wheels trying to find evidence of wet or moist ground or sand/dirt. Top link is pretty obvious, and it was driving in a low lying area, and had this damp clay cling to its wheels, so much so the wheel was entirely covered and it got bogged. 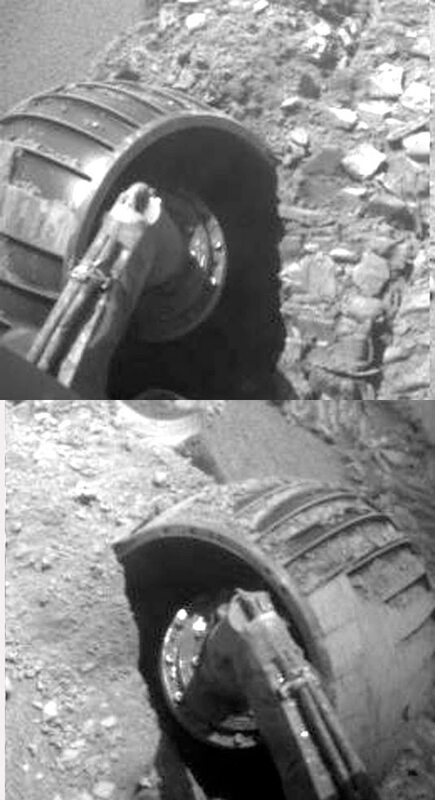 With the obvious question being how can clay or sand, (NASA, sig*) cling to the wheels, when it is bone try??? NASA also poked fun at their agenda by calling the area with reference to sailing ship wrecks, (the cattle will never get it so no damage done). Left side may get away with fine sand, (like the apollo astranauts ran into on the moon) but right, if that were true and this stuff was bone try but clumped due to fine particles, then just like the left wheel no trace of it would be present if it came off. Fine particles again, but more likely wet or damp clay soil and it got the better of the rover, well almost. More signs of recent water flows most likely from passing rainclouds. Wind doesn't or cannot produce this affect only water running from the surrounding areas into this central channel can. This one could be ignored that it is just displacement of soil, but the location make it more likely to be water flows. Mars does have seasons of cold and warmer, and most likely more rain during the colder period. 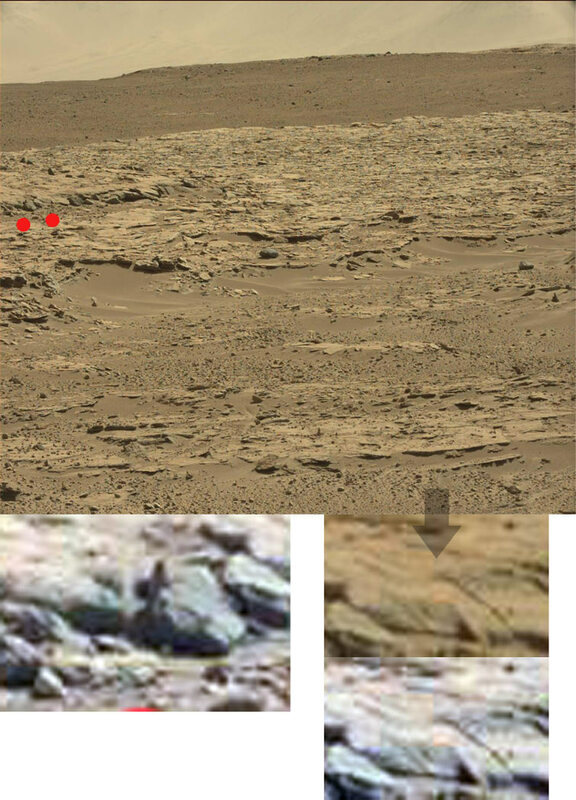 Curiosity was sent to a dried River Delta, where the river emptied into the ocean. 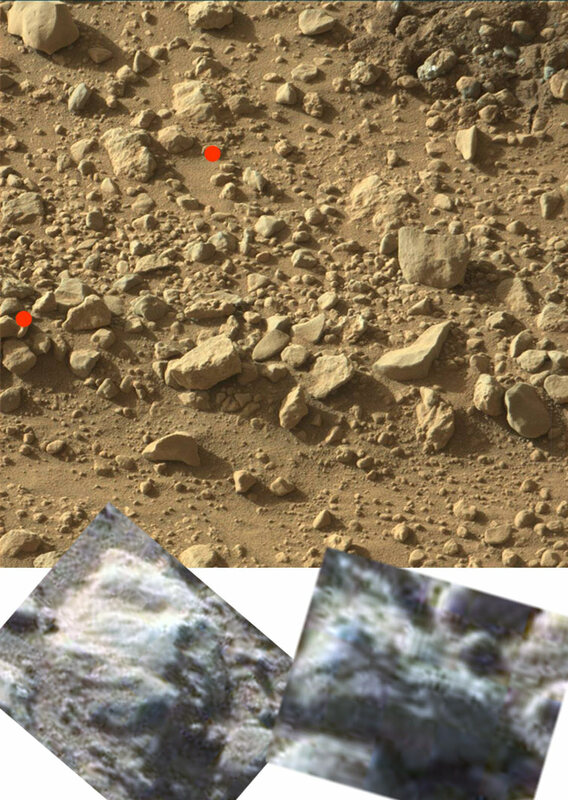 Data from the neutron and gamma ray spectrometer show hydrogen in the soil. Too much hydrogen for minerals such as clay, it has to be permafrost. NASA already said that. This river delta is one of the locations with permafrost. The dried ocean floor is another. And IR cameras on orbiters measure surface temperature; at mid-day during summer the surface warms above freezing. NASA already found multiple rivulets in the sides of canyons/gullies where melted permafrost produced surface water that ran down hill. So why the big surprise at wet mud? Because NASA says that the soil/sand is bone dry, and it is impossible for pure water to exist at ground level! 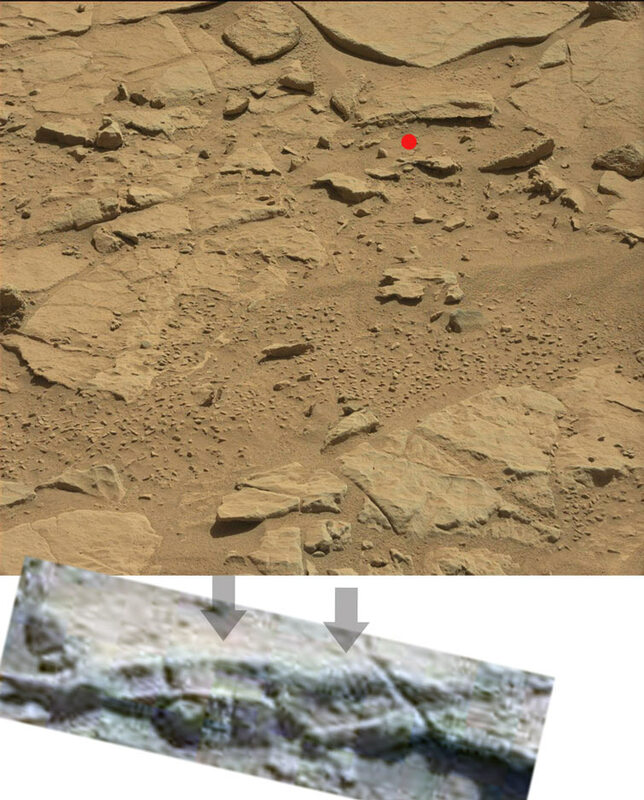 Permafrost cannot turn into saline water then flow down a hill, (it would supposedly melt and boil away) and water droplets cannot form on the rover from no where, and rainclouds cannot create saline rain, (PURE water forms around a particle of martian dust). I think you're too harsh. They realized liquid saline can exist when an orbiter observed the first rivulet. Actually liquid water can only exist in a narrow temperature range due to low pressure, but salt extends that range on both ends (freezing and boiling), and Mars surface temperature is in that range. Liquid surface water can evaporate but Mars atmosphere is thin so can't hold much, consequently water evaporates slowly. Did water from observed rivulets evaporate or soak into ground and refreeze at sunset? No way of knowing. In other words, NASA isn't lying and the drops of rainwater on the rover formed through frost, (eventhough none is found on the landscape, and the rovers chassis is warmer than the ground temp) and it would boil away at the rovers present level, (l put in a link previously that clearly states or NASA clearly says that it would boil away at the rovers level). 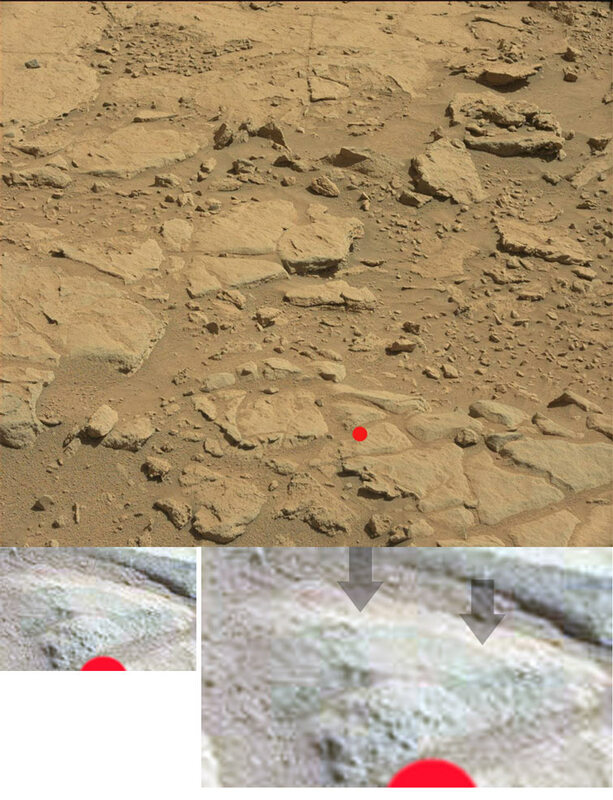 Or it is caused by excessive amounts of salt on the rover, eventhough none is present on some areas with the raindrops on it, and it could not be frost since the rover is heated by saline running around its nuclear reactor or if it is not shown on the ground it is guaranteed to not be on the rover). And the wet soil at the time of the waterdrops is a coincidence, or briney soil? And all of the images l keep finding of rainclouds is beats me, but l guess NASA will come up with something? And we can ignore all the green, and excessive oxygen coming off the planet, (google that one) the ESA image showing the blue sky, that strongly indicates large amounts of water in the atmosphere, (water vapor, clouds, rain might be a connection there). I would normally suggest reading the odd 700 posts again, but l doubt that would make any difference, but if you think that NASA is wonderful then it is! And Mars Earth like sunsets are,.....l guess we will have to wait for NASA to come up with, ahem give us an answer. 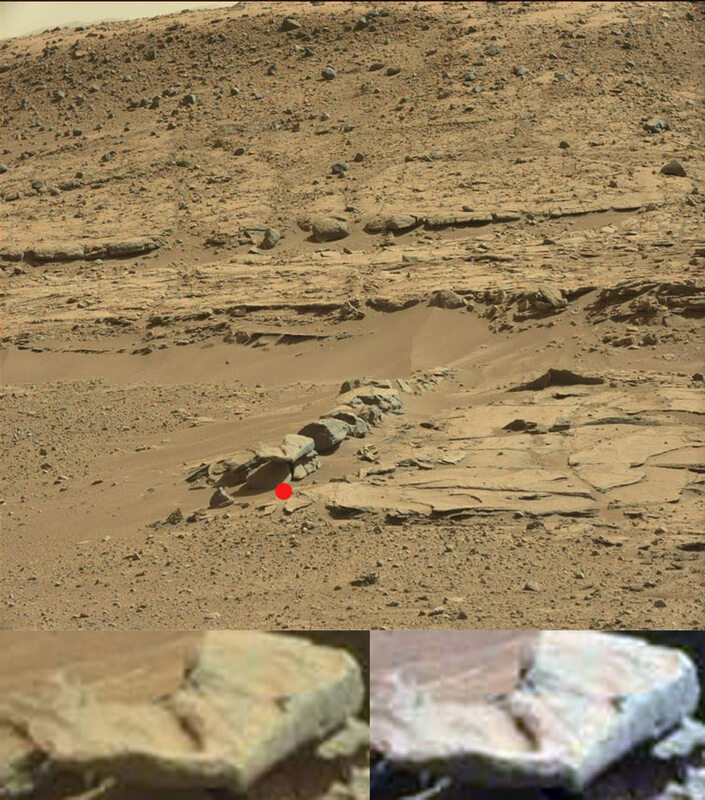 I know that Mars has silver type rocks, but this seriously looks like some twisted metal, (didn't red mark it since it is obvious). Best guess that this is part of an ancient house or step. This top image is a ref, of the hill, and has patches of green, (CP shows lime to grass green) as well as what looks like a house on top, bottom another rain bearing cloud, sigh! Ok, l may have got ahead of myself for the top one, is is more likely just showing the sun setting, a white sun! The rock below that showing blue mountains and green on the left is cooler, (yes blue mountains and a red atmosphere, lol, the locals must be laughing their heads off, considering the crap some humans can come up with). First, top, the rover on a pretty steep gradient. And bottom a pretty good image of the real landscape, with the rover probably on the right, sun settings, and no blue to be seen apart from the distant hills. And the dark stuff in the foreground that looks like shrubs, that is exactly what they are, the CP shows lime green but mainly yellow to brown, so half dead shrubs or bushes. More sunsets and shrub images on the left just to show that this isn't some rock detail related thing, and the right, l distortion corrected this one, which shows the sunset, right and bushes and blue hills, etc but it is the clouds that are the best aspect. If Mars only has high altitude cirris clouds then why does it look as if a Martian downpour could occur at any time? I wouldn't trust NASA any further as l could throw them. 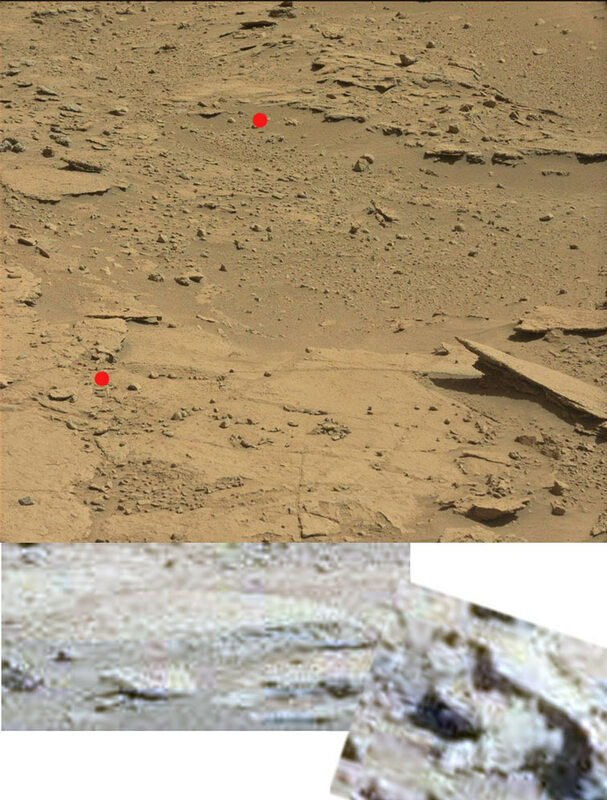 Mars rover on the right, (white thing with the tall thing) and the left, gutter, bridge but whatever it is water is flowing from it. Nice,.... left sun setting, (a green sun = blue sky + yellow sun + red dust) and on the right these tall things, (CP shows yellow to grass green) or in other words, martian prickles, or cactus. And we send more powerful probes into space to see more of some distant worlds, has to be NASA's running gag. 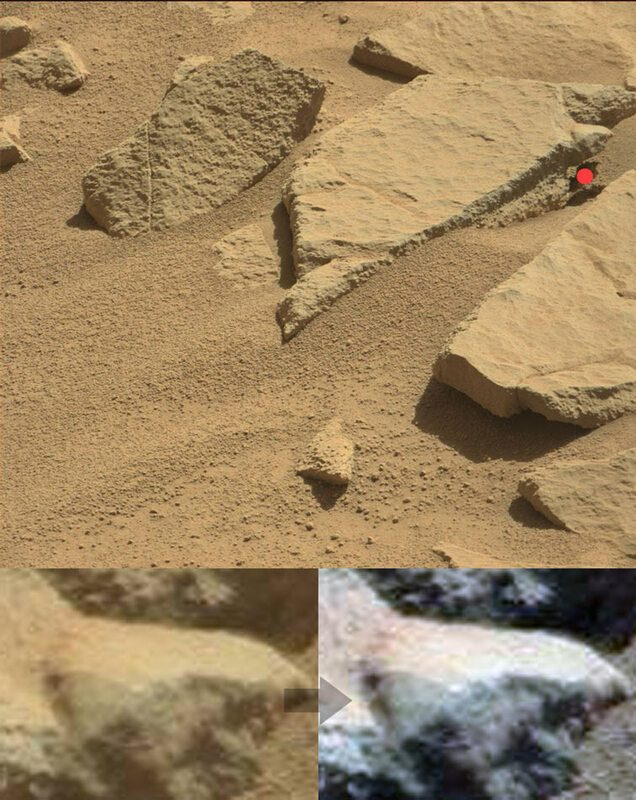 Found this weird thing today, and also found it in several ref, rocks, so it can't be passed off as a rock detail, etc. Appears to be a sculpture on steel rods, and l also found green on this, so moss or plant life on these things is also present. This gives a better view, and CP shows green, so at least this one resembles the Chinese stunted plant sculptures, or it may be locals are forcing this plant to grow in a particular way. Last one, more sculptures on rods or strong wire, which may move with strong winds, or remain stable, but either way not natural. I know they could just be weird plants, but these show a very shiny, silver tower in the middle of all of this. Left a possible face made from the plants, and the silver tower in the middle, and the rest this silver tower, or a series of silver disks stacked along a central spine. 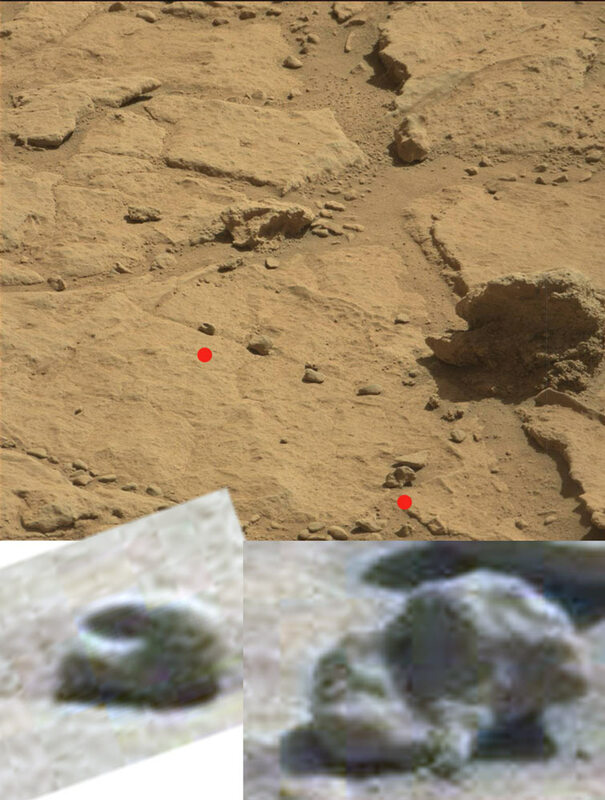 Very likely that this is Not the rover, and NASA drives right past concrete proof that Mars has intelligent life on its surface. 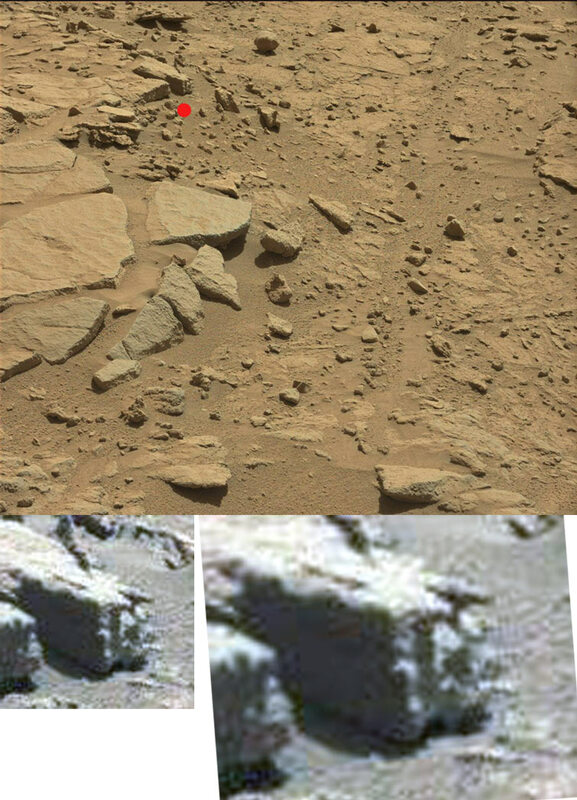 And drive right past concrete proof that mars has plants. Ok, mostly sunset evidence today, (or evidence that NASA is lying). 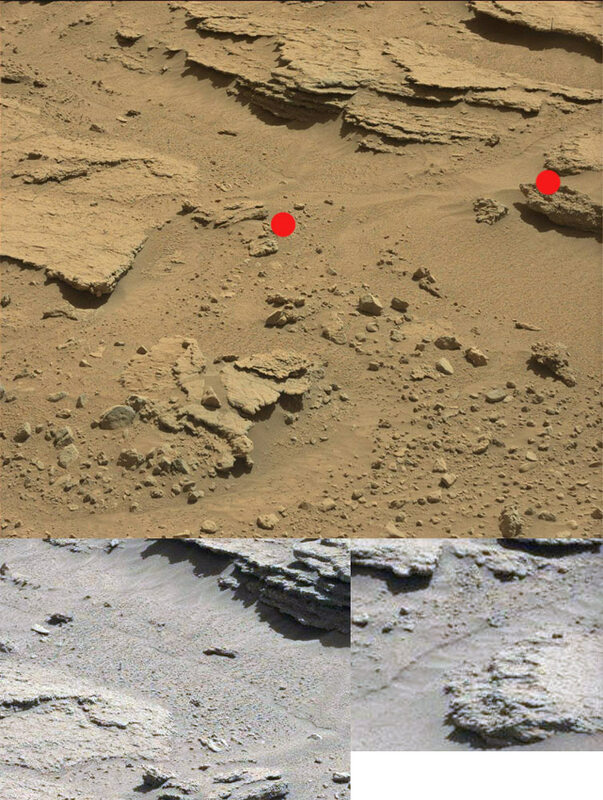 Top, more examples of recent water flows, bottom Mars sun setting. Or left NASA's false color example with an orange sun, (that shows NO blue sun), and right true color showing a blue sky and light orange sun, or solid evidence that NASA saying that all martian sunsets are wall to wall blue, are an outright lie. Top, NASA false color, showing a blue sky and orange sun, (still no blue) and next true color showing a white sun and Earthlike blue sky, (the actual sun is more prominent in the lower part and clouds may be highter up, eventhough it makes little difference). Lower left hint of a blue sky and light orange sun, right blue sky, (like Earth) and white yellow sun, (like Earth or us). So any way you cut it, Mars does NOT HAVE an all blue sun, landscape sunset. And why would NASA lie about this? Because if it is confirmed that Mars has a blue sky or atmosphere, (and green when the dust picks up) then that strongly implies water vapor in the atmosphere, and that puts a big dent in the air pressure lie, or strongly implies rain, and so forth. NASA is releasing this trickle so a percentage of individuals who are not run by fear can understand the true nature of our nearest neighbor, and keep relative order when this is released within the next 20 years, (stop the brainwashed, brick walls trashing a tv store, since their entire belief system got smashed). I expect that by 2033, NASA will circle Mars, land on one of its moons, and show the world the monolith or its markings to the world, then a few years later level with us about Mars itself. Probably cause global riots, by a percentage of the ones in denial and proud of it, but also be very satisfying to say "l told you so,....."! Ok, more sunset evidence or slam dunk evidence that Mars has sunsets like we do, (or our desert areas do). Left image hints at a blue sky and orange sun/clouds, still no blue sun/landscape. Right shows a white sun, (middle of rock) and beautiful pink orange and white clouds, not this blue everything crap. Right my color corrected one or theirs, either way orange sun only. Left some more of these weird things on wire. And this, bright thing in the middle is the sun, but yet again no blue sun to be found. And bottom another one of these weird sculptures, that isn't the rover, and seems to be dotting this waterway on the banks. Unlikely that these are ancient as they couldn't have stayed up for half a million years or longer, so are more recent. So the locals appeasing the gods of rain, seems like the most likely explanation. 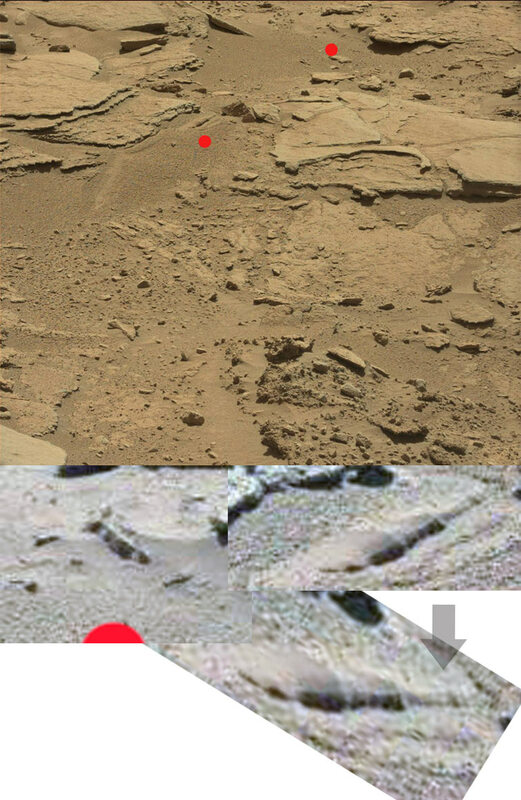 and PS the layered thing l saw before was the rover, unfortunately, (saw it in the ones above). A few more to confirm the sunset color but these are more along the lines of a recent rainstorm. 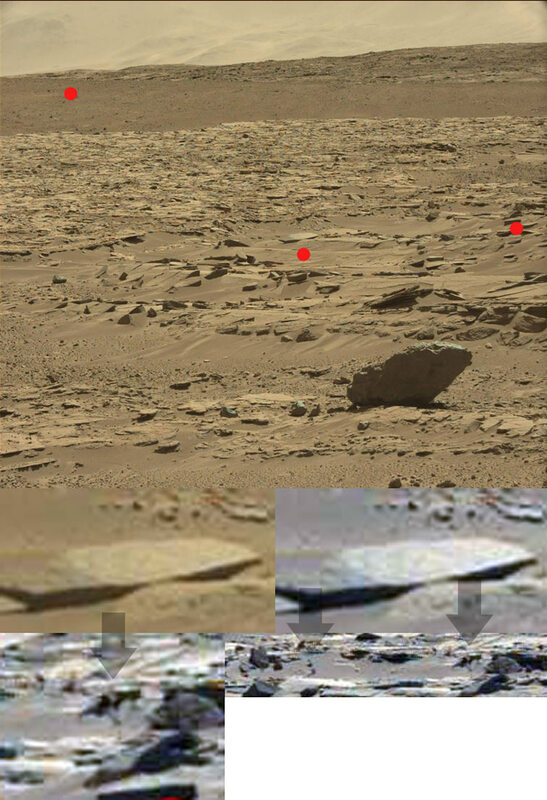 First this cool ref, rock, showing the rocks around the rover, and with a sunset in the distance, (doesn't matter if you are looking as NASA's one or mine, no blue sun in sight). 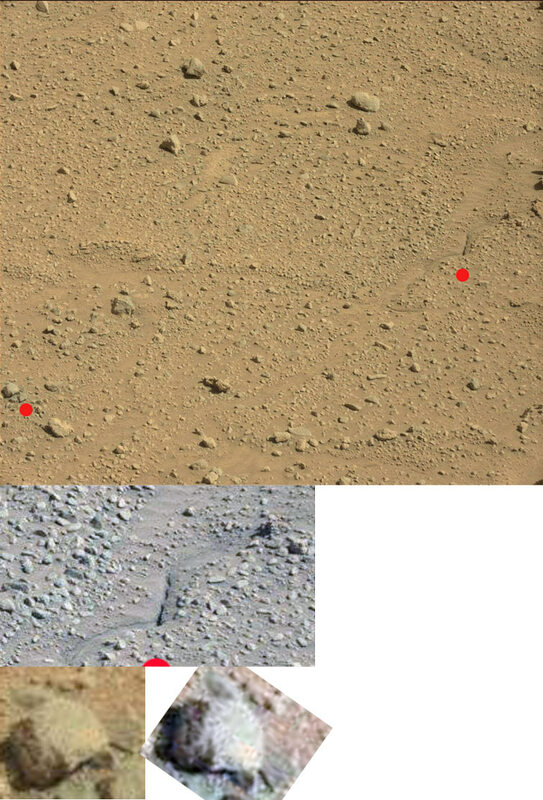 I also noticed in this one, that the ground may be damp, (rovers tracks) and it is, or this area went through a shower or rainy period. 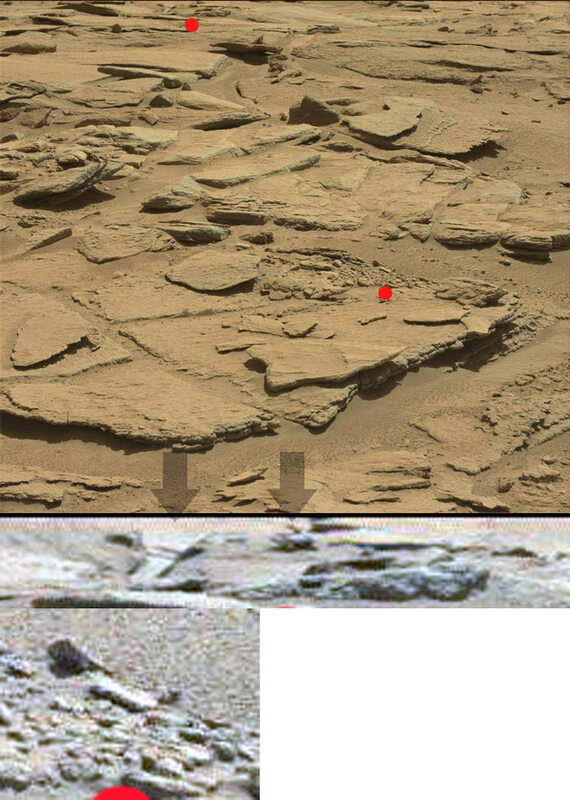 Lower image shows distant pools of water in this dry river, (ref, is just visible in the left one) top image sunsets. And last one more good images of a martian raincloud with a hint of blue sky on the right, (the white middle thing and stuff on the right is the rovers robotic arm, etc). Mainly fern type martian plants today. Left, CP shows a lot of green, so a plant of some kind, and right, these ones are more yellow/brown/green but the top, right hand corner showing one with a cloud and blue sky behind it, is a good one. Left hand image shows this same curved leaf, (best guess) again, (l know this because the sun is directly behind it in both images). And the right hand image, (left) shows the unmistakable curved stem of a fern like plant. We can argue that the wet soil is brailine related, but going by Earths ferns, they need plenty of consistent rainfall and moderate temp's in order to survive, which most if not all, of the water l am finding is rain related or pure, (ferms cannot grow in -200 overnight temp's, with a near vacuum atmosphere and no rain). 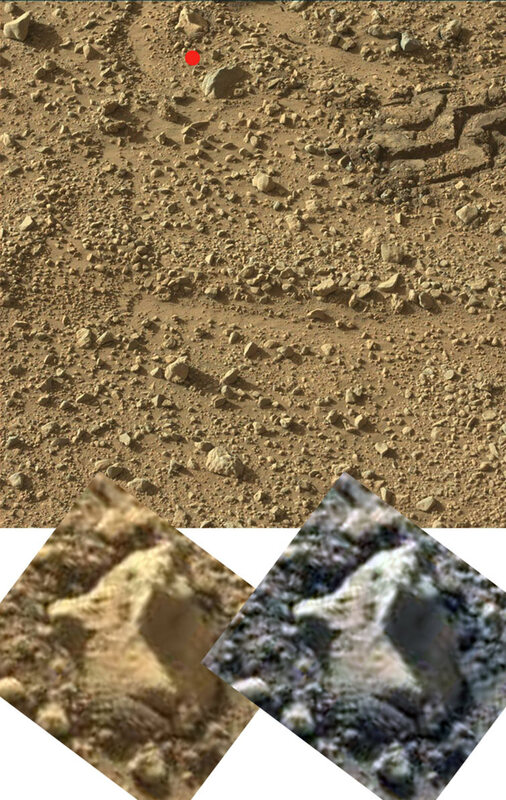 Also another ironic point is Viking taking blue sky images when it landed in 77, NASA said they were a mistake and reddened them up, (a ton of examples above) but Curiosity also took a raw image of a self portrait with a blue sky, with NASA saying nothing about any technical errors, so does that mean Vikings original blue sky, frost and green rocks are the correct ones??? Nice video showing the first year animation of the rover, built up by the images, and all with a blue sky, and yellow sun. 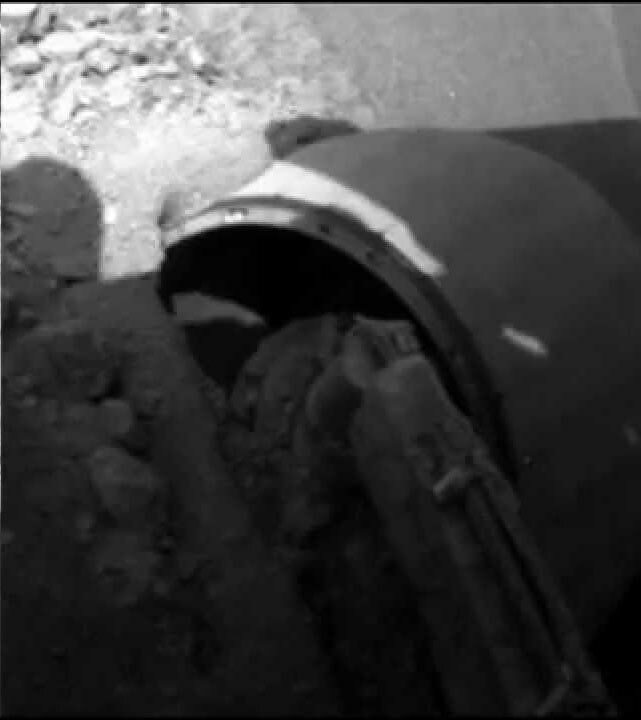 Phew, well l had a further chat to the creator and unfortunately they colorized all the images shown in the video, (as l do to show the real color) although as l have recently shown with pointing the camera at the wheels or ground, that clearly a pig color filter is used to mask water and green colorization. So this is what we would see if NASA cut their crap and told or showed us what is there, or that Mars has a permanent blue atmosphere and saying that this disappears is insane. Another sunset, with no blue, and a pink/yellow sky or clouds in the color corrected one. The sun is at the white part of the blue spectrum, CP but that is about it, and the green fron or branch which the arrow is pointing towards shows a strong green CP color. This is the real Mars, Earth like sunsets, permanent blue atmosphere and vegetation, with the occasional rain or shower and advanced lifeforms. Another pretty obvious artificial find today, but that is last. 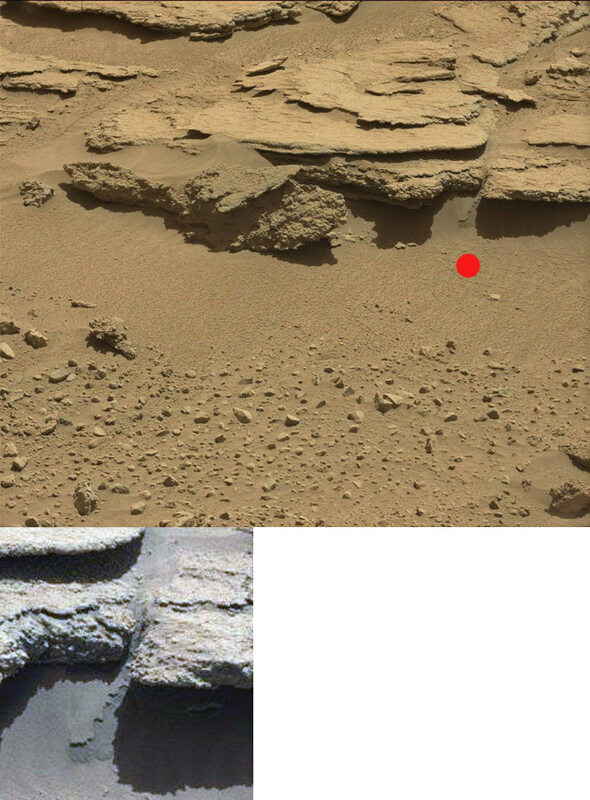 First a martian plant on the left image, and the sun setting, right what looks like a martian sculpture, or weather vein or arrow, either way unlikely that it is the rover. And then this cool discovery. Left regardless of whether it is a NASA pig image or color corrected, it still shows a yellow sun, blue sky and pink clouds. Then we have this cool discovery of capital lettering in the side of this hill. There are too many to just dismiss this as an anomaly, and NASA of course smudged some of them, but we can still make out some of them to get an idea of what it originally said. "HUMAN", is the best l can make out from this.